Light rail vehicles are built for flexibility, literally. Low-floor vehicles provide accessibility benefits and double-articulated bodies allow the train to make sharp turns, letting designers use tighter curves on track alignments. This is useful for street-running, in cases where the alignment is constrained to the roadway grid (e.g. between Westlake Station and University St Station) or in areas where land procurement can be avoided (between Beacon Hill Station and Sodo Station). It offers additional leeway for the infrastructure designer and provides some cost savings. These characteristics present challenges when operating the vehicles at higher speeds. Yes, the effects can be mitigated. Yes, some light rail vehicles are capable of higher speeds. However, they require additional mitigation from both the vehicle manufacturer and the infrastructure provider. Many factors influence the type of wheel profile that an operator may choose to use on their trains. These include the curvature of the infrastructure, the design speed and the type of rail. Generally, for light rail applications, coned wheels are used in order to navigate tight curves. On Link, the wheel profile is a 1:20 taper. Coned wheels connected by a rigid axle allow rail vehicles to steer around curves by creating a differential in rolling radius. When in a curve, the inside wheel rotates with a smaller radius, and travels a shorter distance, than the outside wheel. This differential reduces friction and flange contact, reducing wear on the wheels and the rails. Coned wheels also provide lateral forces that keep the rail vehicle centered along the railway and prevents flange contact, reducing both wear and the risk of derailment. If the train shifts to the right, the rolling radius difference steers the train back to the left, then back to the right, etc. The side-to-side movement is eventually damped and the train will become centered again. However, it only does so below its intended design speed. The lateral forces of coned wheels increases with speed. Above a “critical speed”, the higher lateral forces begin to overcompensate when the train becomes off-center from the tracks. The damping effect that allowed the train to become stable at lower speeds is overcome by the higher lateral forces. This leads to a continuous side-to-side motion called hunting oscillation, which if not mitigated, leads to flange contact, excessive wear and even derailment. As a result, many trains that operate at speeds higher than light rail vehicles don’t use strictly-coned wheels. While Link vehicles use a 1:20 taper, a German standard wheel profile DIN 25112 Type C used for conventional rail contains a 1:40 taper for most of the contact surface, with 1:20 only towards the outer edge. At higher speeds, this reduces lateral forces, but allows for stabilization when lateral movement is extreme. However, the situation becomes even more complex. The wheel profile must also be accommodated by the shape of the rail profile themselves. After all, it’s the interaction between the rail and the wheel that determine vehicle dynamics. It is in fact possible to use rail profiles that support higher running speeds with 1:20 wheel tapers. On the other hand, a flatter wheel could also show excessive wear on un-optimized rail profiles. Amtrak’s high-speed Acela trains, which operated on tracks with more curvature than other high speed systems, showed increased flange wear as a result of wheel profiles that were not optimized for the rail profiles. The takeaway here is that generally, coned wheels are less stable at high speeds, but railway profiles can be modified to achieve a conicity that allows for higher speeds and lower wear. The trick is to make sure that new infrastructure is designed for the rail vehicle(s) using it, and that existing infrastructure is modified (if necessary) before new vehicles enter service. If high performance is required, then it has to be designed into not just the structure and alignment, but also the wheel-rail interface. Light rail vehicles like Link contain double-articulation using a short center trailer. To achieve a low-floor design in the middle of the train, the axle is removed, allowing the wheels to turn independently from one another. 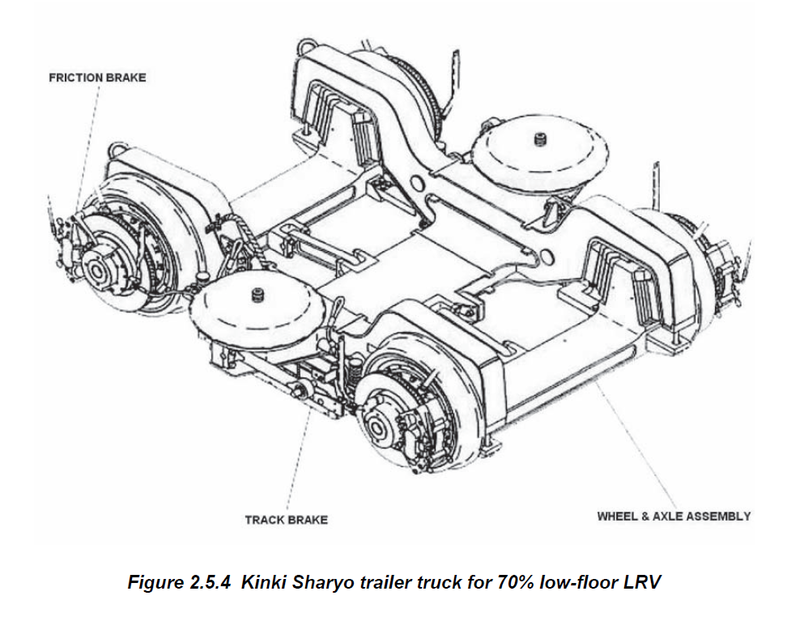 The combination of short center trailers and independent wheels has a few implications. We’ll discuss a few from this study sponsored by the Federal Transit Administration. Without an axle, the self-steering mechanism that stabilizes the vehicle (in this case the center trailer) is removed. Coned or not, the wheels are free to rotate independently of one another, which means it no longer self-steers towards the center of the track. As a result, flange contact becomes more common with IRW systems. In some situations, such as tight curves, turnouts or even when travelling at higher speeds on straight tracks with unevenness, the trailer may be guided by the flanges of the wheels rather than the rolling radius differential. This contact increases friction, wear and sometimes noise. Trucks with IRW center trucks are, therefore, fundamentally more susceptible to derailment and, as a result, their behavior can be strongly influenced by other factors, which would normally be of only secondary importance for trucks with solid axles. As with any engineering issue, there are methods for mitigation, including modification of infrastructure for better wheel-rail interfaces and maintenance. Wear and noise can be mitigated using several methods, including lubrication, which Sound Transit has done. Additional protection through curves could also be provided by restraining rails. Operationally, the report also suggests that curves should be taken at constant speeds, with acceleration only after the curve has passed. Finally, improved vehicle and infrastructure design can also reduce these negative effects. Manufacturers and operators like Sound Transit have surely learned much more since this report was presented (2006). Generally, this means that it is more difficult for light rail to achieve the same performance (speed, acceleration, curving capabilities, etc.) compared to a conventional train. By the way, some rolling stock use systems that resemble IRW systems mentioned in this article, yet operate with high speeds, such as the Alstom Citadis and WSDOT’s own Talgo trainsets. Alstom’s Citadis is an example of a 100% low-floor tram that can operate at high speeds, but the wheels are connected by a low-level driveshaft linking the wheels together, which do not make it a true IRW system. Talgo’s trainsets use a passive steering mechanism to overcome the lack of rolling radius differentials supported by an axle. So how does this apply to Link? The purpose of this document is to demonstrate the complexities that result from designs specific to light rail and to show that it’s not simply just a vehicle on rails that happens to bend well. My previous article suggested that light rail may not be the best solution for regional services. On a 60-mile regional line, vehicle performance (speed and acceleration) influences not only travel times, but also travel time reliability. Many comments pointed out that there are light rail vehicles available to provide higher performance necessary for regional transport. For Sound Transit to order new light rail vehicles with greater performance at this time may turn out to be an extremely complicated process. First, it would have to determine what kind of performance increases would both reduce travel time and improve reliability. Next, it would need to work with manufacturers to determine if a vehicle is available to provide these needs. Then, they must together determine whether the new vehicle or the track infrastructure requires modifications. Increasing the speed changes dynamic forces, and dynamic forces require mitigation. Finally, if the changes to the infrastructure are necessary (rail grinding, wheel profile modifications, etc. ), they will have to be applied and not at a low cost. Operational requirements should dictate the type of vehicle that is used. The infrastructure is then built to support the vehicle. 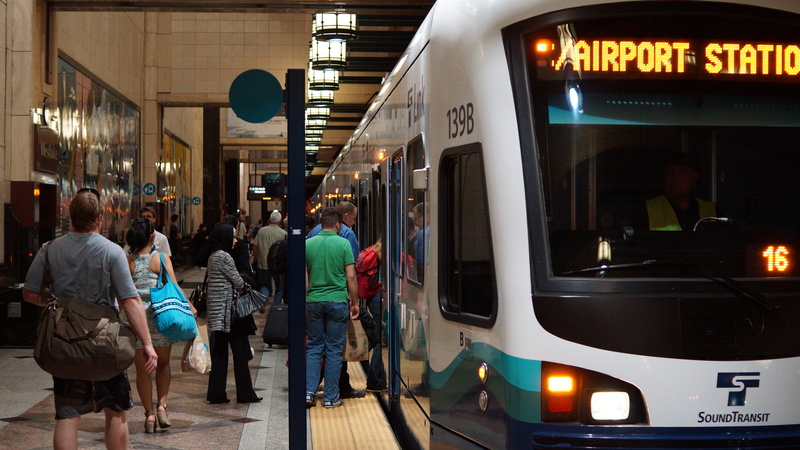 In Seattle, low-floor light rail has been selected to provide flexibility in city centers. The infrastructure and the vehicles have been designed to operate below freeway speeds, much slower than cars and buses except during congestion. What our light rail system lacks in performance though, it makes up for in urban flexibility. Urban areas is where its capability shines. Perhaps Sound Transit is willing to figure this out. They may be willing to work with manufacturers and procure higher-performance light rail vehicles that fit our infrastructure. Or maybe they’ve already considered all of this and the tracks are ready to support the next-gen Link train. That’s something we can’t say yet, but it’s certainly worth having a discussion about, especially when a chunk of a $15 billion package is potentially on the line (pun intended). For now, however, by pushing our light rail system as it is to operate regional services between Tacoma and Everett, it may not offer the type of performance that regional services need and deserve.